Hey guys! I’m really honored to be featured on Krista Van Dolzer’s latest Agent-Author Chat. Scoot over there and check out my query for DOOR NUMBER FOUR, the manuscript that caught my agent, Mandy Hubbard’s eye, as well as some great advice from Mandy herself. 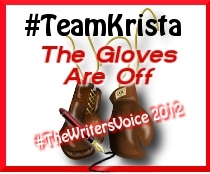 While you’re there, follow Krista, because she’s pretty awesome. When you think of a happy family, what image comes to mind? A mother and father, two or three kids, maybe sitting around the dinner table, laughing, one of them slipping a veggie to the family dog? What about romantic relationships? A couple walking through a park, holding hands? Perhaps a midnight swim in a cool lake, or leaning across a table in a low lit restaurant? When you think of war, what do you see? Tanks? Explosions? Men in camouflage running across sandy terrain with bulky packs? Those same men around a fire at night, this time in their undershirts, joking with each other and thinking about their loved ones at home? Think of anything: spaceships, a company office, a baseball team, a band, an animal shelter, a Hollywood movie set, an African safari. How much of the images that come to mind is based on what you’ve seen on television, or in movies, or read in a book? I would hesitate a guess and say most of it. That’s my experience anyway. I’ve never experienced war, or been on a spaceship, or gone to Africa. Every image I have of these things, every preconceived notion has been told or depicted to me by someone else. I was thinking about this the other day and realized that writers play a pretty big part in shaping our world. Not just our world, but our idea of the world. This realization was little intimidating at first. I mean, the ideas and pictures in my head could possibly influence the ideas and pictures of someone else. How many of you, when thinking about the distant future, immediately picture flying cars and metallic clothes? Sky high cities and robots? Even if that image is displaced by something else, was it the first thing that came to mind? Did you imagine something like the Jetsons? I do. Because that’s what I’ve been told the future will look like. Popular culture has ingrained it in us for decades. But this idea, this notion that writers set the molds, it’s not just intimidating, it’s freeing. I’m currently revising a manuscript and setting it, literally, on another world. When I first sat down and looked at the blank page, I was scared to death. Then, slowly, I began to grasp that this new world could be anything I wanted it to be. Arthur C. Clarke and Stanley Kubrick are a great example. Look at “2001: A Space Odyssey.” Computers that were small screens and operated by touch, flat screen monitors, voice activated systems, video teleconferencing. All these inventions that were, in 1972, a mere dream, implausible, not realistic. Yet, we have them today. You may have heard about Apple suing Samsung for patent infringement of their iPad design. Here’s what I find most interesting about the suit. Samsung argued they couldn’t infringe because the ideas all came from Kubrick’s film, and from another called “The Tomorrow People,” not from Apple. Did these films influence Steve Jobs? Well, I don’t know, but I think the argument is there that it could have. Did “Friends” influence the way any of you saw life in New York City? Did “Sleepless in Seattle” influence your thoughts on love? Did “Platoon” influence how you saw war? Or “Apollo 13” how you viewed space travel? What I do know is this: scientists, researchers, engineers, and a slew of others have the job of thinking outside the box within the constraints of plausibility. But writers…writers get to push further. We get to expand our minds and create whatever we want, and dare the scientists to catch up. Clarke, and then Kubrick, created these technologies, and forty years later the world made his ideas a reality. Arthur O’Shaughnessy famously wrote, “We are the music makers, and we are the dreamers of dreams.” I say, that’s exactly what writers are. The ones who dare to dream. Who knows, that scene you’re describing now may be the first image someone else thinks of when they hear of that place, that couple you just wrote may shape another person’s view of a happy marriage, and those “implausible” inventions you’re creating in your mind today, might one day become a reality.